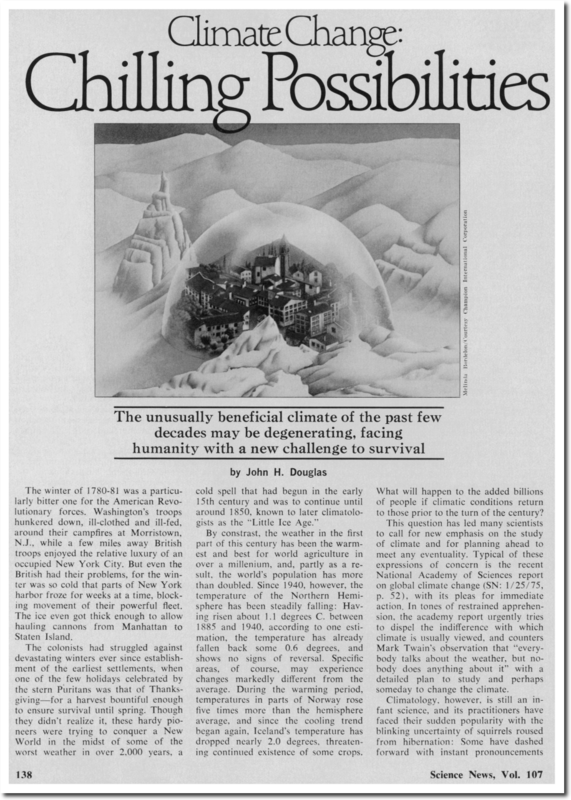 When the National Climate Assessment was released last fall, a massive barrage of hysterical propaganda came with it – like this article in The Atlantic saying we are all going to burn up, based on an increase in US heat waves since the 1960s. 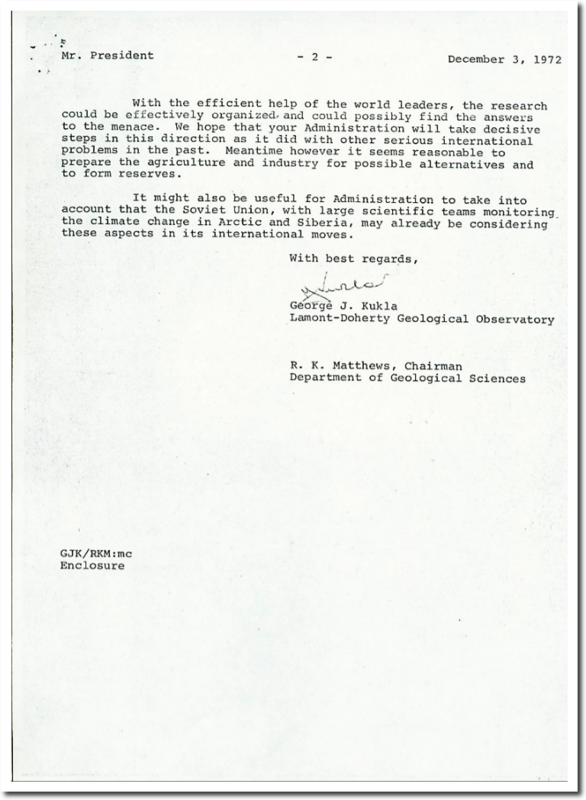 But why did they choose the 1960s for their start date? 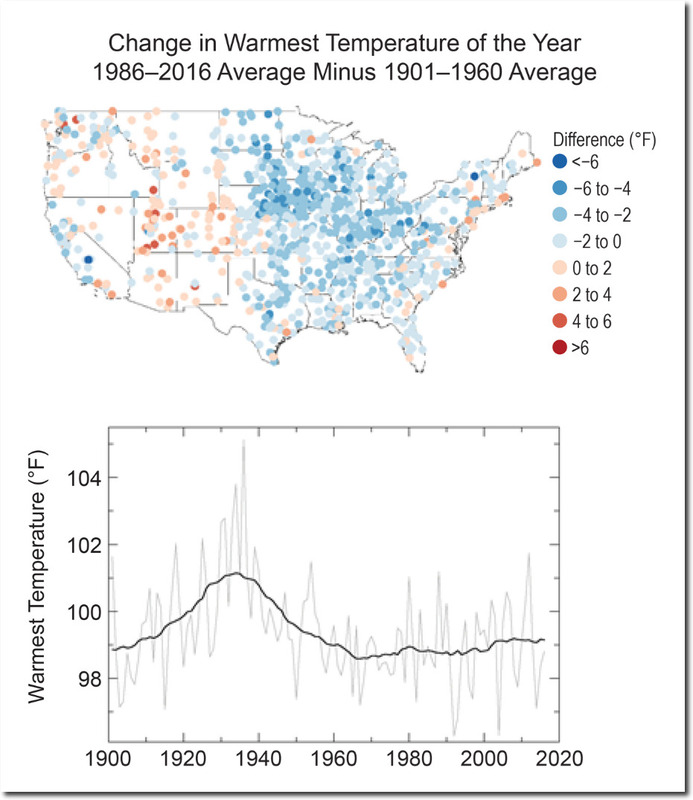 The US has excellent temperature records going back the late 19th century, and in fact the 2017 National Climate Assessment showed heat wave data going back to 1900. 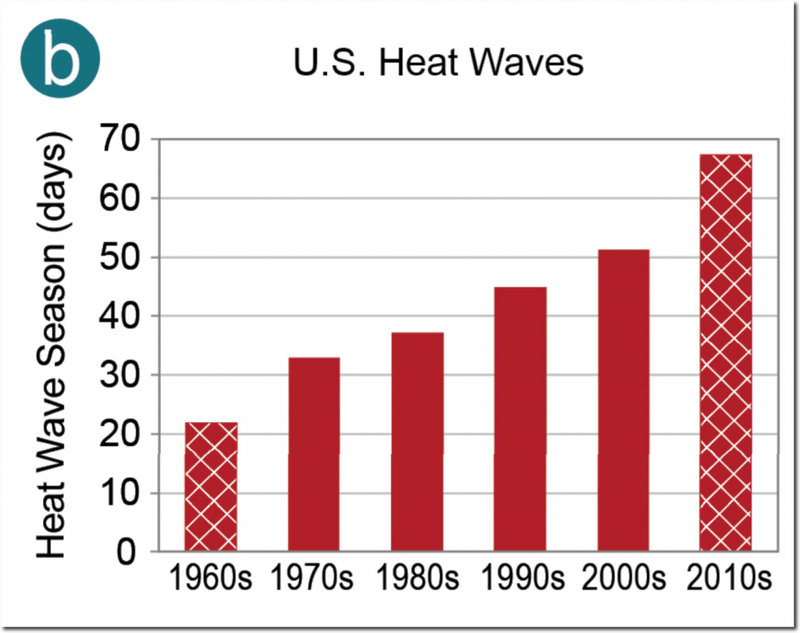 The 2017 data showed unambiguously that US summers were much hotter prior to 1960, and that the 1960s and 1970s had the fewest heatwaves of any period in the US. This very important data was excluded from the 2018 report. 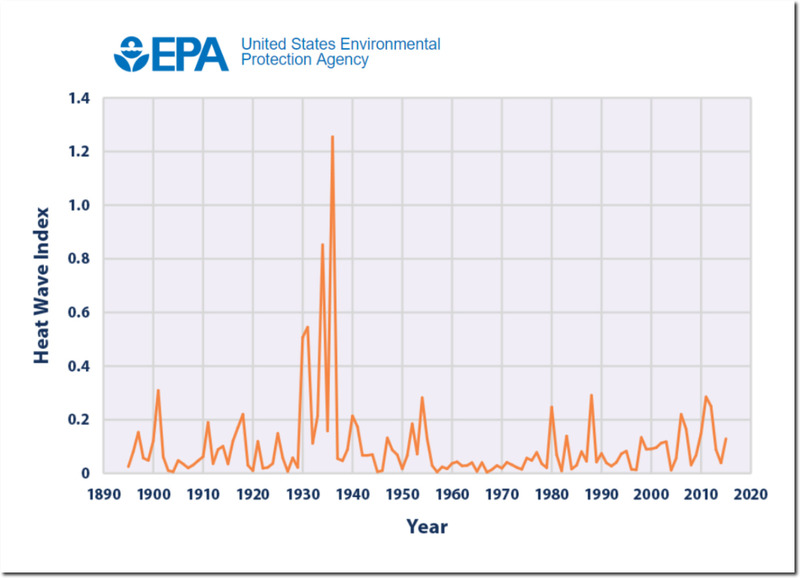 Data from the EPA shows the same thing. I overlaid the 2018 NCA graph on the 2017 NCA data, and it becomes very clear what they are doing. 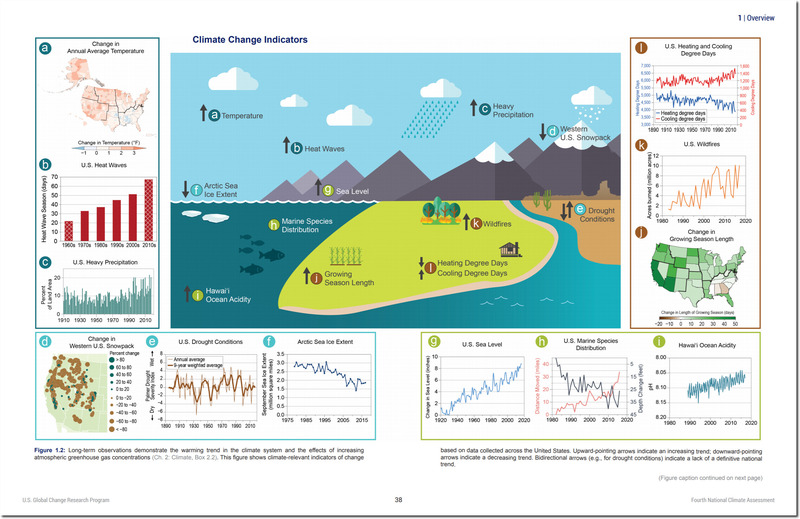 The 2018 report released to the public, cherry-picked the only start date in the graph which they could use to create the appearance of a warming trend. 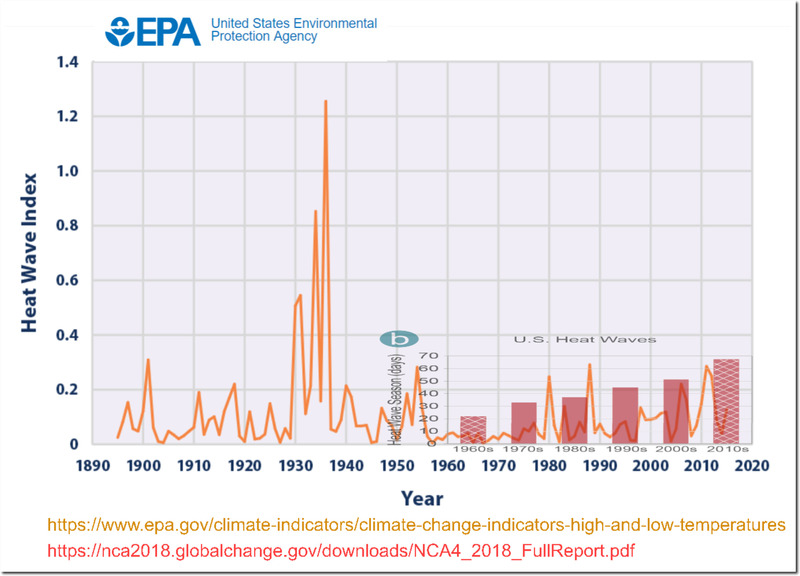 Here is the same overlay with the EPA graph – once again showing the extreme fraud in the 2018 NCA document. The next two graphs show the very hot pre-1960 weather which is being hidden in the 2018 NCA report. Reality is the exact opposite of what is claimed in the Atlantic article and the 2018 National Climate Assessment report. 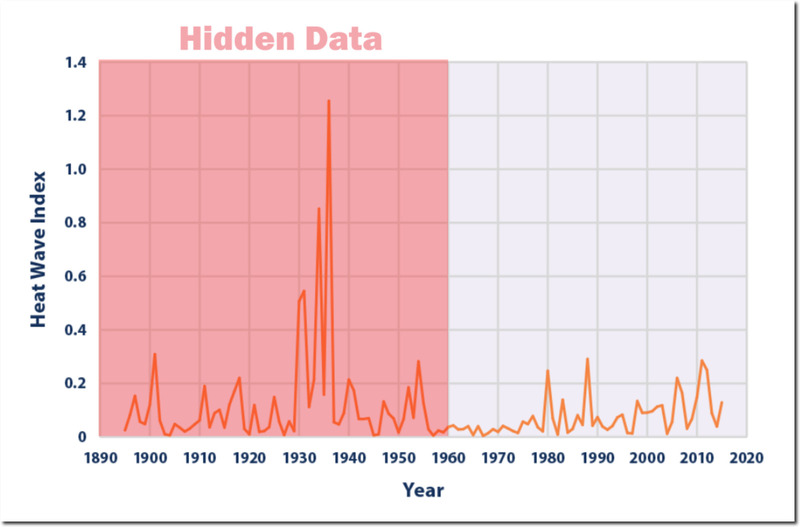 The frequency of hot days has plummeted in the US over the past century. 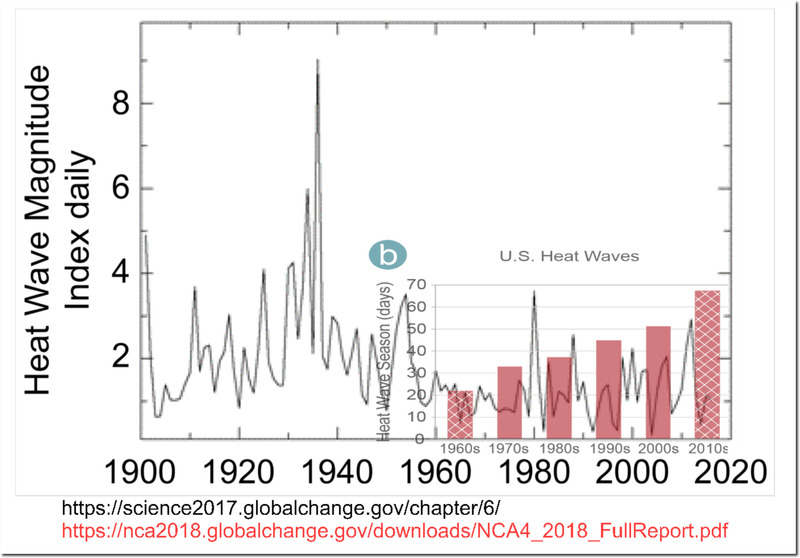 The number of all-time record maximum temperatures peaked in the US in the 1930s, and bottomed in the 1960s when then the NCA started their graph. 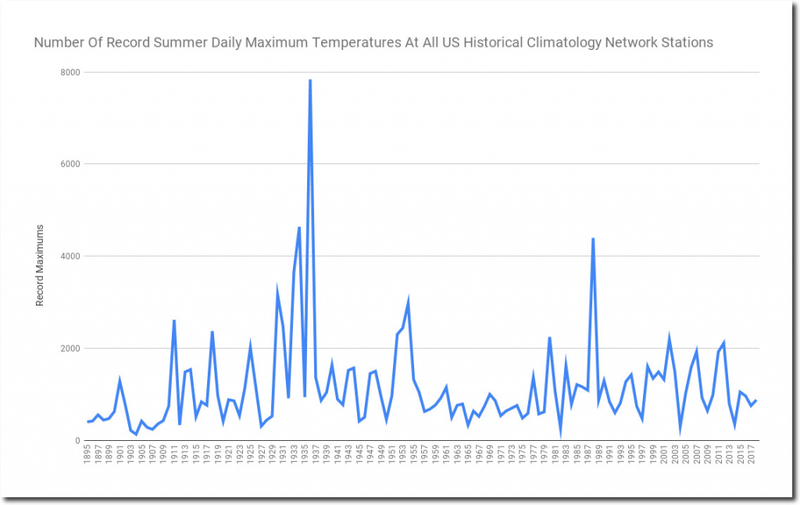 The number of record daily maximum temperatures in the US peaked in the 1930s, and bottomed in 1960’s, when the NCA started their graph. 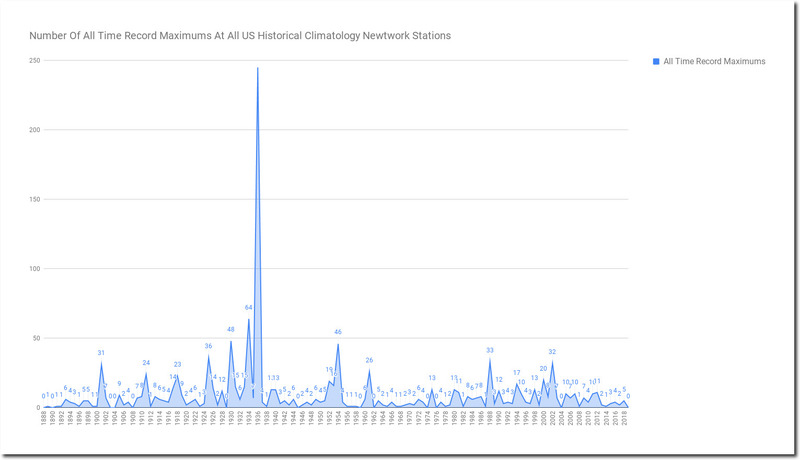 The 1930s were extremely hot, and thousands of people died in the heat. 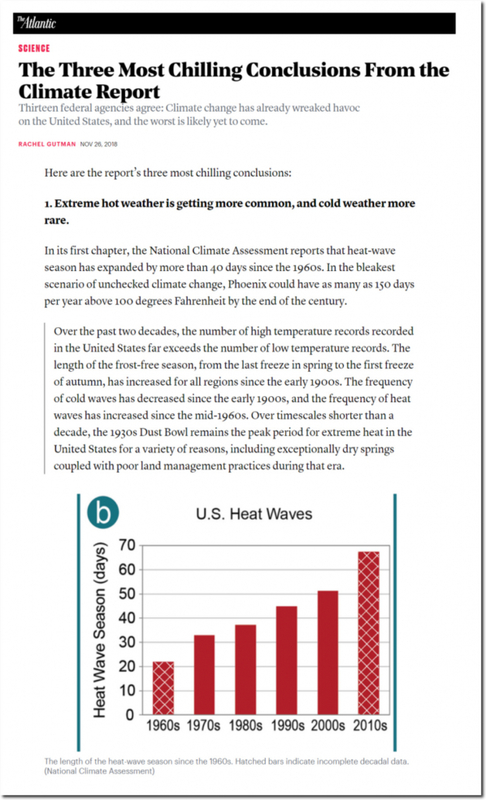 During June 1896, Parker, Arizona had seven consecutive days over 120 degrees – a record which was only matched in 1905. Since 1960, the longest stretch of days over 120 degrees in Arizona is three. 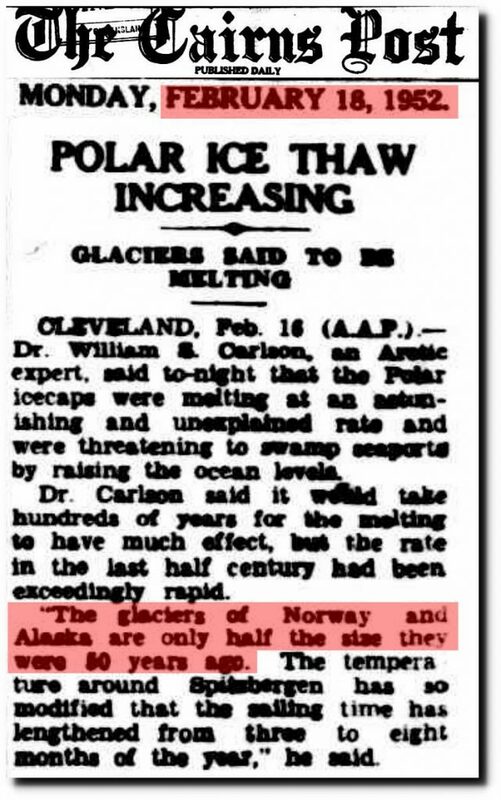 The 1896 heat was not confined to the US. January, 1896 was the hottest month on record in New South Wales, Australia. 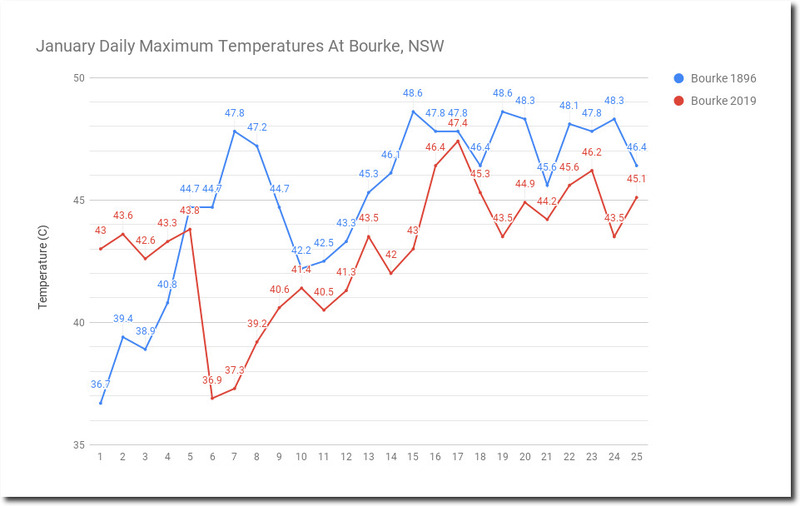 Bourke averaged 110 degrees that month. The Australian heatwave of January, 1896 was much hotter than this year’s claimed record heatwave. 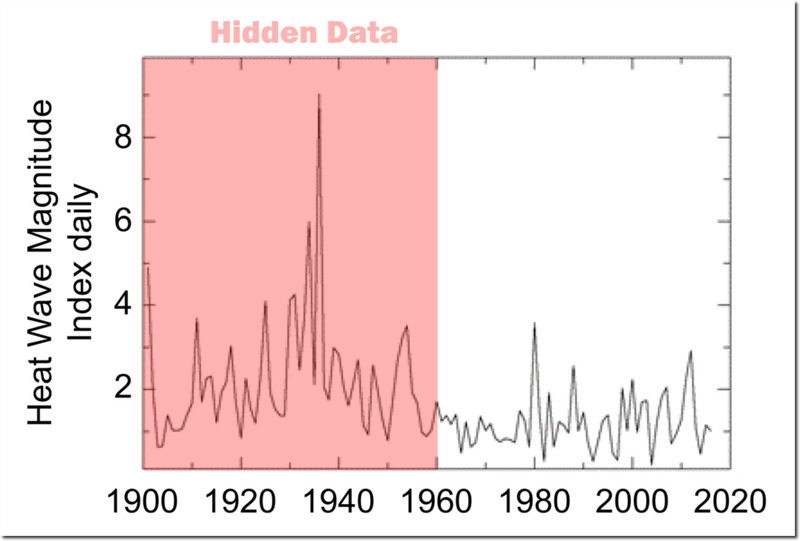 Like in the National Climate Assessment, the Australian Bureau of Meteorology hides all inconvenient hot temperatures prior to 1910. 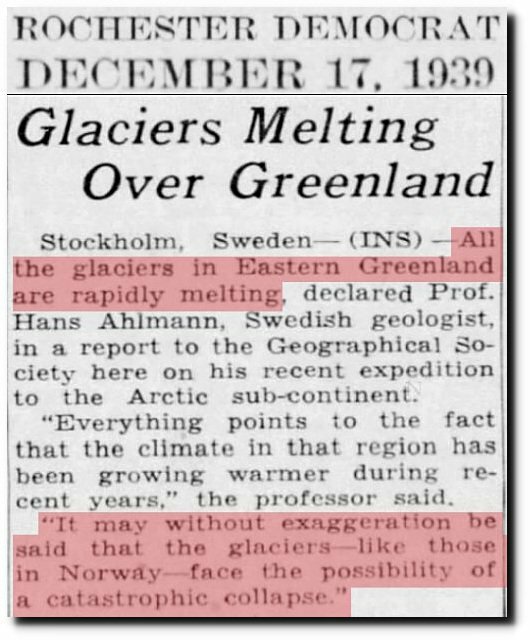 The 1930s heat was also not confined to the US, with glaciers rapidly melting in Greenland, North America and Europe. 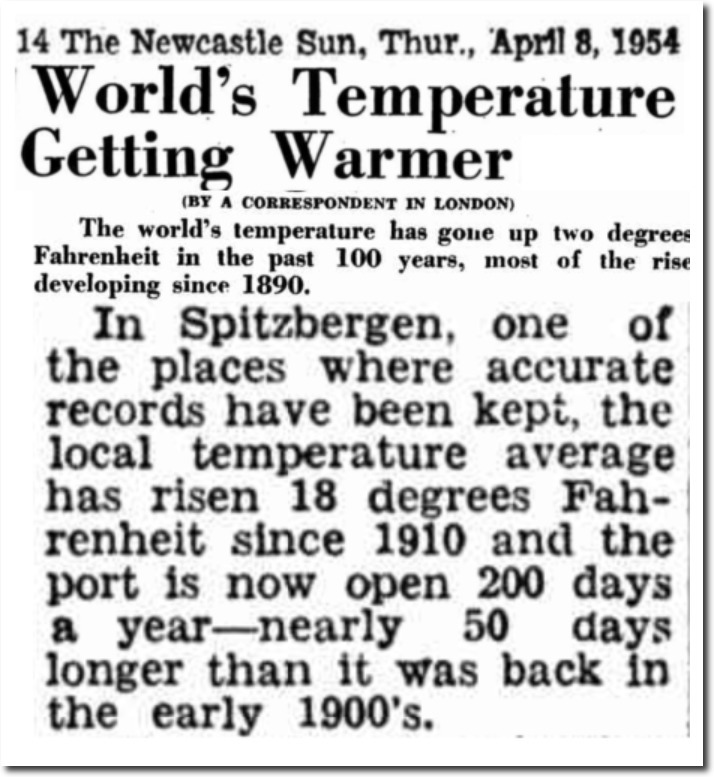 By 1954, Spitzbergen had warmed 18 degrees. But the warmth of the 1930s and 1940s, turned rapidly into cooling, and by the 1960s there was unanimous consensus the Earth was cooling. 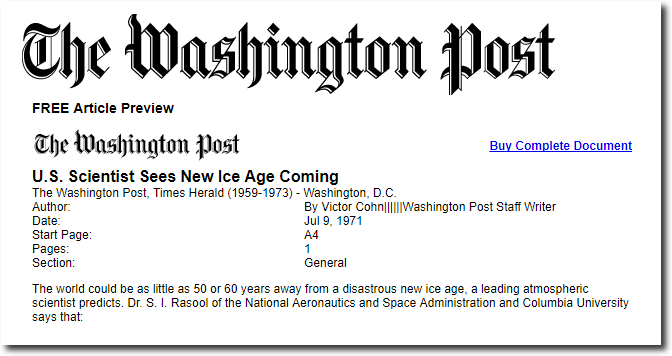 NASA predicted an ice age by the year 2020. 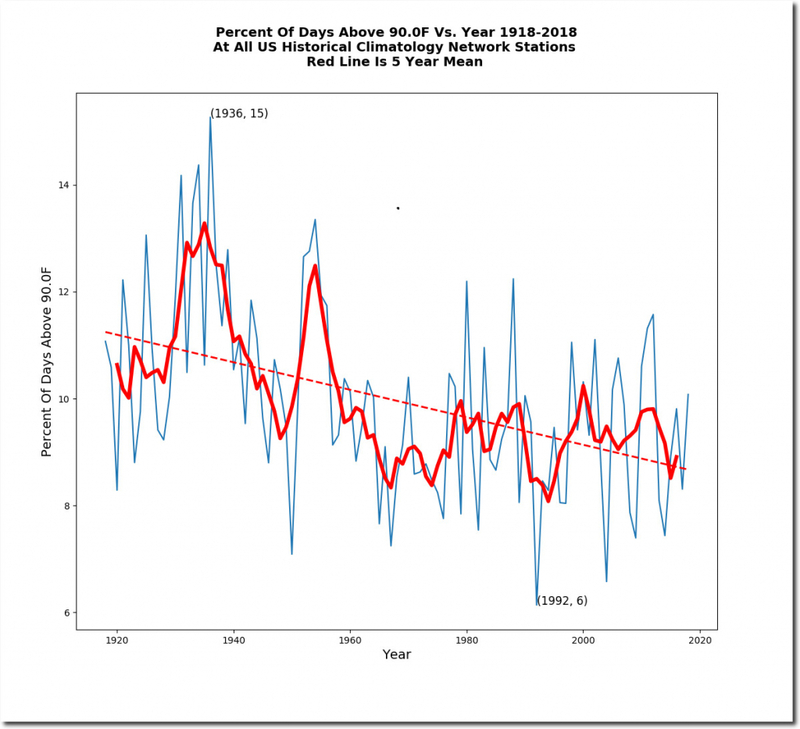 It isn’t difficult to see why the 2018 National Climate Assessment chose to start their graph during the very cold 1960s, and hide all the hot weather prior to that. 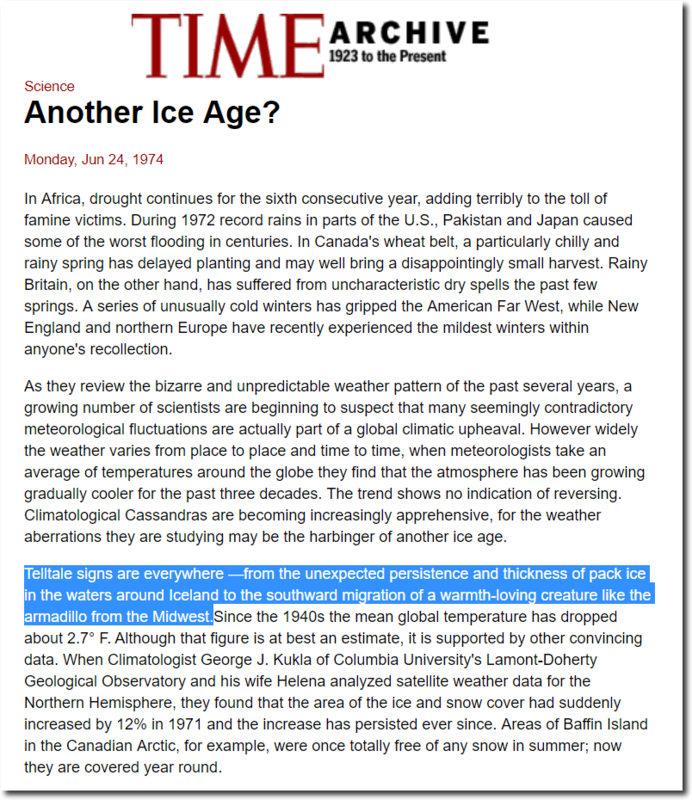 They are committing blatant fraud, deceiving the public, and telling a story which is the exact opposite of reality. 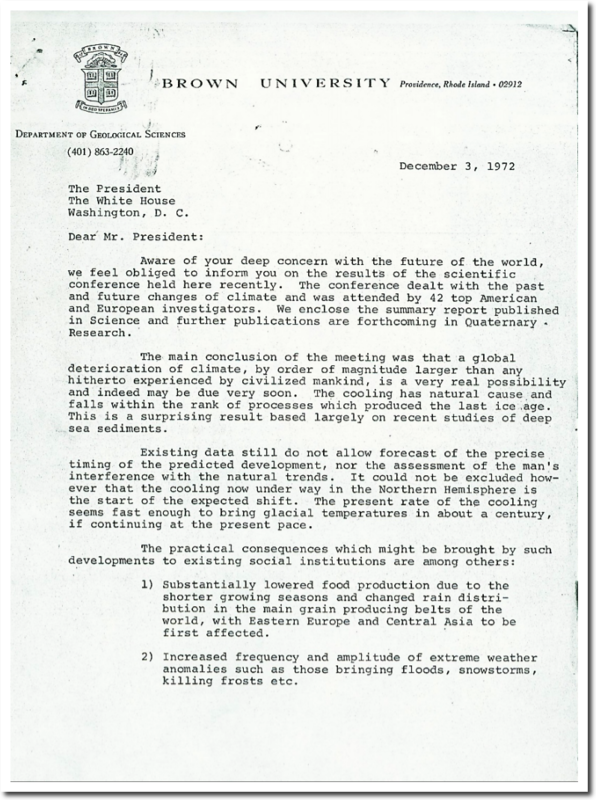 This is exactly what President Eisenhower warned about in his 1960 farewell address. Scientists are attempting to seize control of policy. 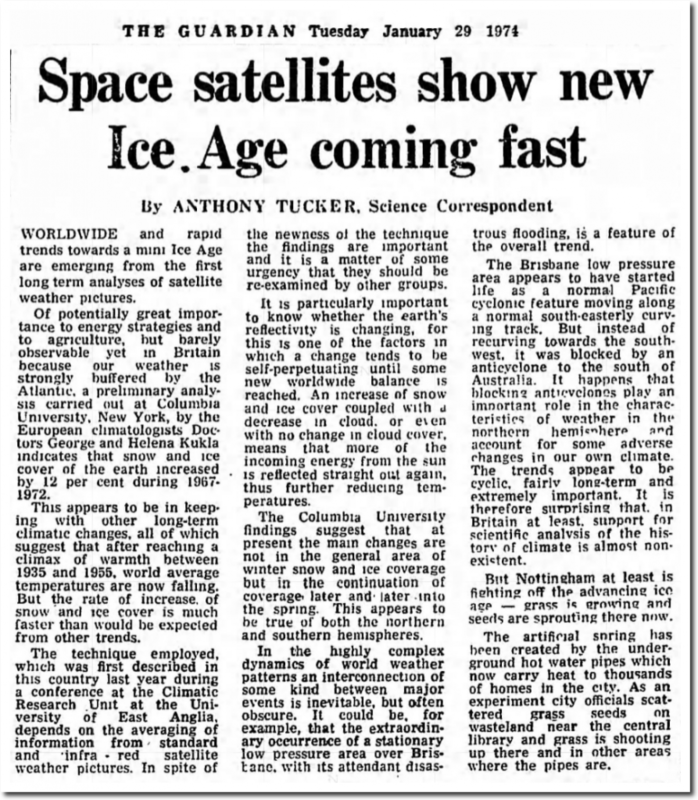 but somehow the timeframe of the 60ies&70ies that was scientists ultimate prove for the coming ice became retroactivly the starting point of global warming. and on tuesday he gets beaten up by them because he walked without a dog. 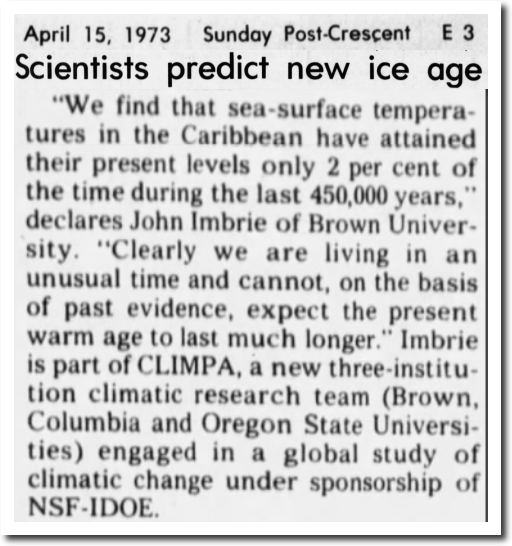 Global warming alarmists are telling me, “those are just scary headlines, not real peer reviewed scientist papers” I keep pointing out these prophecies that have not come true, but they just deny deny deny the articles were meant to be taken seriously in the first place. Then claim, the actual science… The peer reviewed papers that appear in journals… do show the earth will warm up and we’ll all be on fire!! 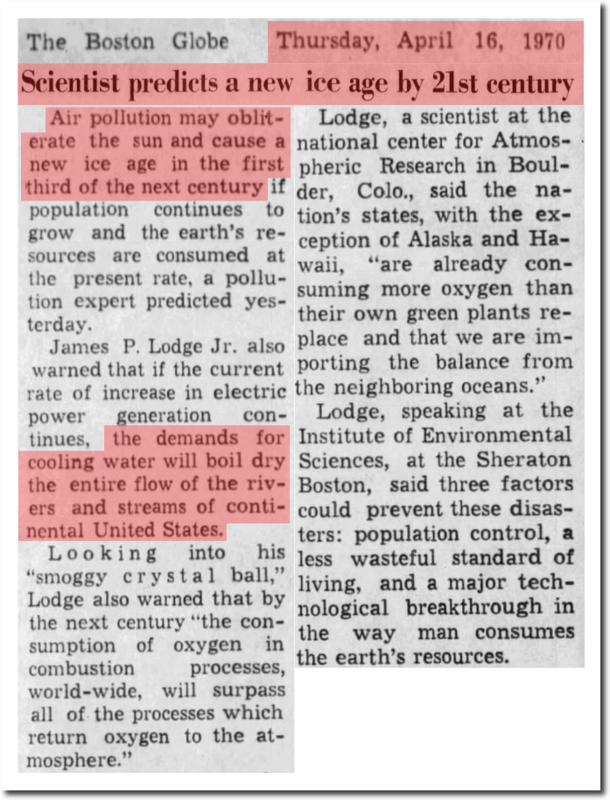 On the one hand, average people don’t know what CO2 even is or how photosynthesis works, they don’t know that H2O-vapor totally dominates any radiative downforcing, they don’t know how to read charts, they don’t know that sea levels are *not* accelerating, they don’t know that oceans have many layers with different temperatures that take 100’s of years to mix, they don’t know heat comes up at places of tectonic spreading, they don’t know how hot it was in recent history, etc etc. 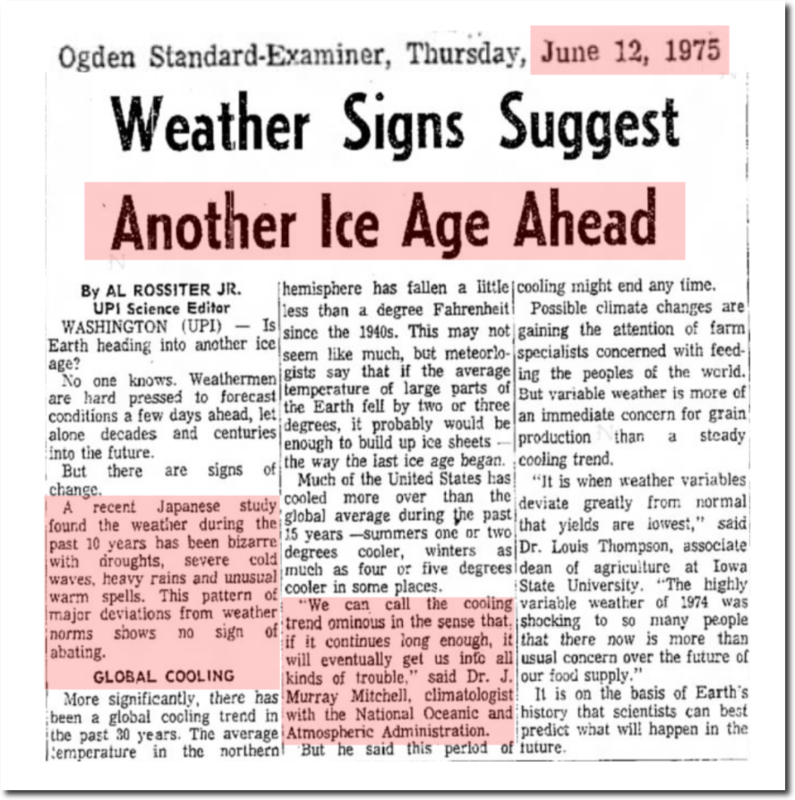 To blame high temperatures in the United States on the situation in the region of the Dust Bowl is way beyond reason. And to top that, the 1930s are not shown in the chart. 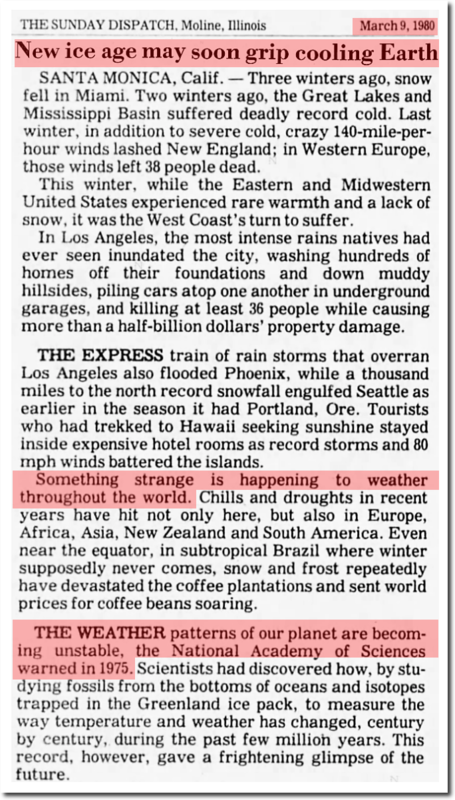 Who writes this stuff, and where are the reviewers, and editors? If you are at all interested in US history, you should read it. 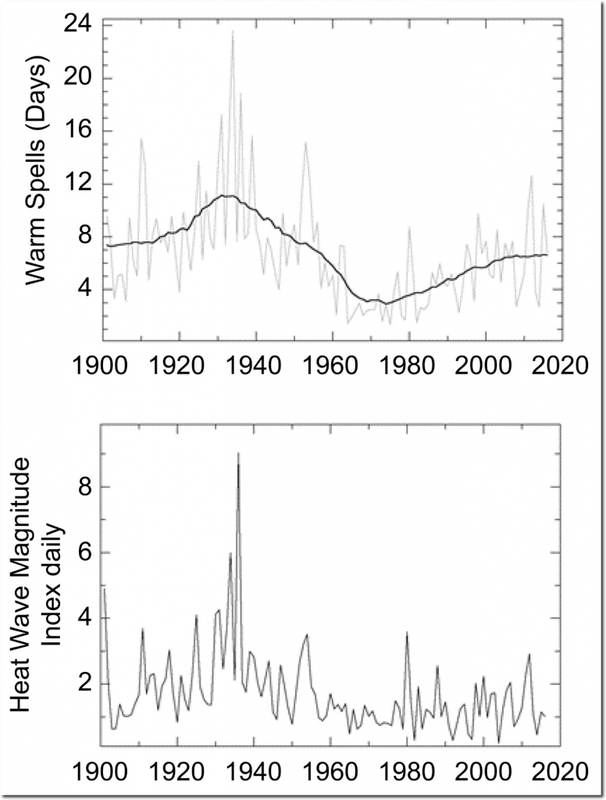 Jo Nova has some details on the 1896 heatwave (1896 was also near the beginning of our Federation Drought – during the 1890’s and early 1900’s). 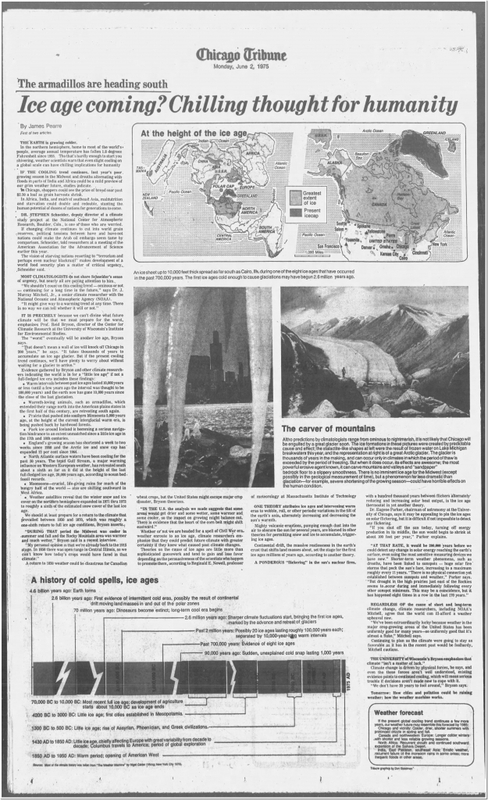 The Daily Mail also carries the story with some graphic old photos. 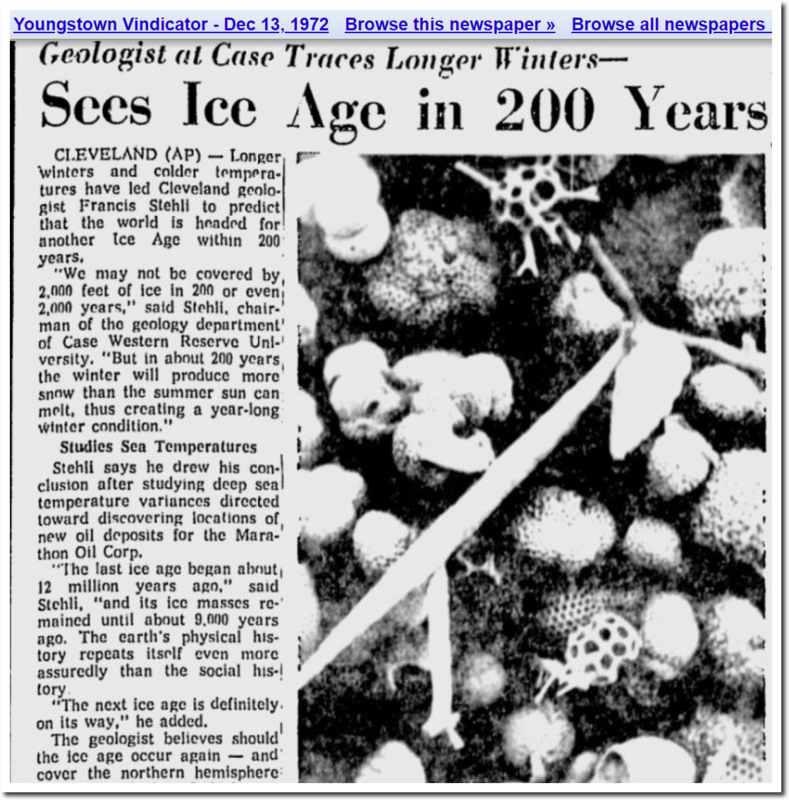 Yes, they did it with fires and Arctic sea ice. Tony: I would like to interview you on my radio show. Are you available over the next few days? Thank you Tony. 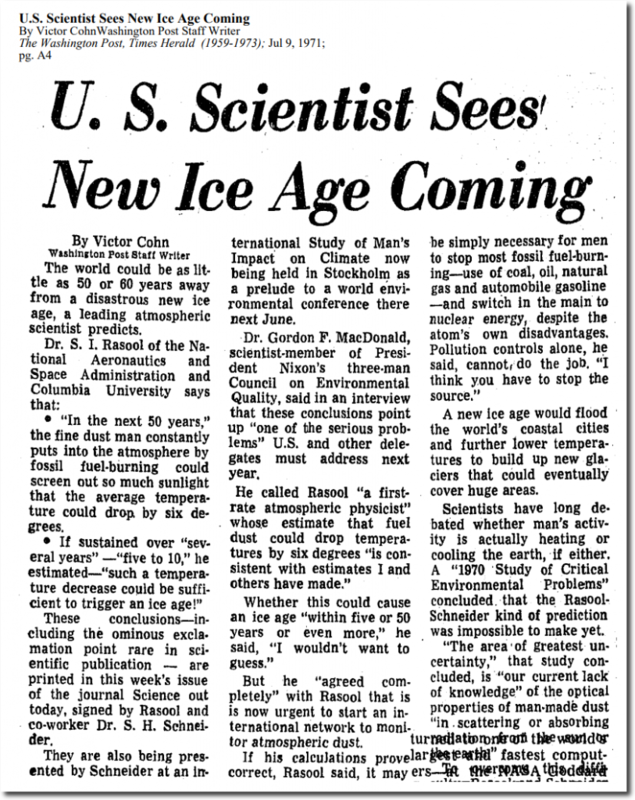 It’s no wonder none of the alarmists want to debate you, they wouldn’t stand a chance. It is way past the time for the lying, fraudulent felons to go to prison. Tony, you have indicted them!